We know by now that communication, simply speaking, is sharing of information between the two parties. Such an exchange could be oral or written, personal or public using words, figures, symbols or a combination thereof. The process of communication begins when one party (called source, sender or communicator) wishes to communicate with another party (the receiver). Communication is complete when the receiver understands in the same sense what the sender wished to communicate. 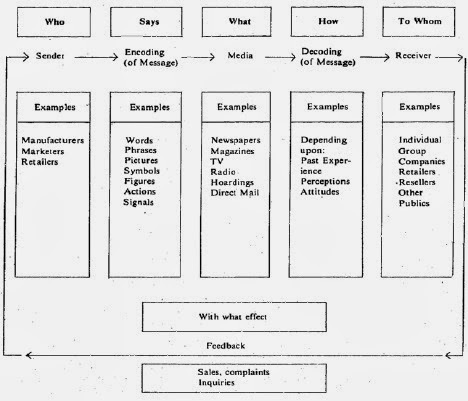 The various elements of a typical communication process are given in Figure I. 1) It is said that peanut butter, launched more than a decade ago in India failed to take off primarily due to its manufacturer's inability to get the concept of peanut butter perceived distinctively from that of the pasteurised butter. 2) Not much different was the fate of an advertising campaign of a leading US detergent marketer who while extending the campaign to the vernacular press of the Middle East erred in not reversing the direction of the visuals used, to make these compatible with the right to left reading characteristic of the media. Consequently, what the readers saw was white and bright clothes when washed in the company's brand of detergent came out dirty and soiled, thus going totally contrary to what the advertiser desired. HOW COMMUNICATIONS INFLUENCE THE ROLE OF PROMOTION IN MARKETING? Mutually satisfying exchange being the ultimate goal of marketing, the role of promotion, therefore, is to encourage such an exchange through linking communications with the product adoption process of the buyer. Motivating the adoption of the promoted product as well as effecting the desired change in the consumer behaviour are the goals of the promotion function. The attainment of these goals presupposes that product purchase process be understood by the marketers before marketing communications are designed. While there are many models that help to conceptualise the buying process, two very specific models that aid in understanding the buying process as well as in framing communication are: 'AIDA' and 'Hierarchy-of-effects' models. The AIDA acronym stands for: Attention (also called awareness), Interest, Desire and Action. According to AIDA model, a marketer should begin by winning attention or gaining awareness, creating interest, inspiring desire and precipitating the action for purchase, in the prospects in order to enable its product to be adopted by the target public. Under the hierarchy-of-effects model, the buyer's purchase decision is preceded by steps such as conviction about the product benefits, preference for the brand, liking for the brand, knowledge relating to the benefits and features of the product, after an awareness of the product has been gained. The basic implication of these models is that the function of persuasive communication or promotion should be handled deftly at every stage of the buyer's adoption process. 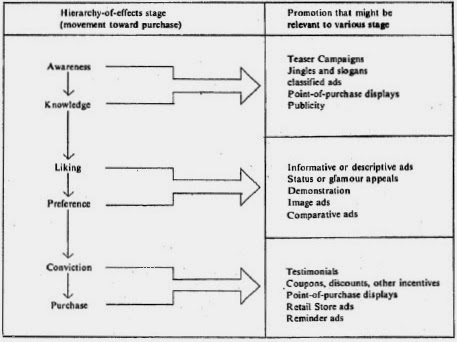 Based on Lavidge and Steiner research, Gaedeke and Tootelian illustrate the various promotional tools that might be relevant to each stage of the hierarchy-of-effects model which is given in Figure II. This Figure also brings out the variety of promotional tools that are available to marketers for making marketing communications.